While the Reds graduated their impact prospects in 2008, a few players climbed the list to fill the void. Neftali Soto is quickly emerging as part of the next wave of impact bats in the system. He has the potential to be an impressive middle-of-the-order hitter at the Major League level. He has a sweet righthanded swing, which makes him somewhat unique in a farm system that seems to produce only lefthanded impact hitters. The Reds may have graduated Jay Bruce and Joey Votto in 2008, but Soto is proving that the Reds farm system is not without promise on the offensive side. 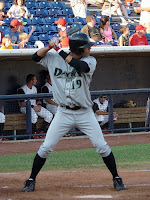 Soto didn't make his 2008 debut until June, when he started off the season at the rookie Pioneer League with the Billings Mustangs. For the Mustangs, Soto wasted little time in ripping the ball all over the state of Montana. In 67 ABs, Soto posted a slash line of .388/.423/.746/1.169 with 10 doubles, 4 homers, and a 10/4 K/BB ratio. His performance included a .415 BABIP and impressive 22% line drive rate. As Soto continued to hit balls off the Beartooth Mountains, the Reds made the obvious choice to promote him to low-A Dayton. At Dayton, Soto continued his strong offensive performance, posting a .324/.342/.500/.842 in 216 ABs. He also hit 7 homeruns with a 36/7 K/BB ratio. His line drive rate declined to 15%. While low-A pitchers did a better job against Soto, his level of performance as a 19-year old was still quite impressive. The obvious drawback in Soto's hitting approach is his lack of walks. While I tend to come down on the side of plate discipline being an inborn tool rather than a learned skill, Soto is still young enough that his current walk rate may not be reflective of his true ability to control the strike zone. In addition, as he continues to build a reputation for being a fierce power hitter, pitchers will work him more carefully and he'll likely receive more walks as a result. Another potential mitigating factor for his poor walk rate is that Soto has fairly low strikeout rate. While Soto's current walk rate is only a tick above that of fellow power hitting prospect Juan Francisco, his strikeout rate is much better than Francisco's strikeout rate. 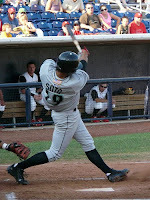 Soto is the all-time youth homerun champ in Puerto Rico, earning the distinction by breaking former MLB slugger Juan Gonzalez's all-time homerun mark. Soto is also one of those rare players that actually make a right-handed swing look good. His setup involves a slightly wider than shoulder width stance and a high back elbow. When the pitch is delivered, Soto takes a very small stride towards the pitcher to transfer his weight. He has explosive hip action, which creates substantial rotational velocity and generates tremendous bat speed. As he clears his hips out of the way, he brings his long, fluid swing to bear on the ball. Despite the impressive bat speed and longer swing, Soto's plus hand-eye coordination allows him to make consistent, hard contact. He seems to have good control of the barrel of the bat throughout the hitting zone. He simply doesn't have the same problem making contact that plagues other power hitters, which makes him a more complete hitter and a more compelling prospect. Soto reminds me a bit of Dustin Pedroia in that respect, as he takes a massive hack at the pitch, but consistently gets the barrel of the bat on the ball. Such a long, aggressive swing isn't supposed to produce such consistent contact, but plus hand-eye coordination makes it possible. Below you can see a few photos of Soto at the plate. In the photo on the left, you can see Soto's strong set-up, which gives him a solid foundation for his swing. In the middle photo, you can see Soto's head staying down on the ball and the good extension, as he gets out-and-through the ball. Also, you can see that the rotational velocity of his swing and the impressive bat speed at times cause him to spin out or roll over on his front foot just a bit. In the photo on the right, Soto maintains good balance throughout his swing and he keeps both hands on the bat in his follow through. Again, it's more personal preference than anything, but I've always favored hitters who keep both hands on the bat in the follow through. Keeping both hands on the bat ensures stability throughout the swing and prevents the bleeding of power from the swing. Of course, some argue that by taking the top hand off the bat you improve power by increasing extension, but if the top hand comes off too early in the swing, then you risk losing power. Of course, you can be successful either way, but ultimately I'm not much of a disciple of the Walt Hriniak style of hitting. Below, you can see a video clip of Soto in action. Here, he hits a bomb in impressive style for the Dayton Dragons. And, here is a clip of Soto as an amateur in a homerun contest. You can see his impressive swing and raw power. In addition, there are some very interesting slow motion shots of his swing fron different angles at the tail end of the clip, so it's definitely worth your time. Soto has very impressive swing for a prospect his age and he will go as far as it takes him. Hopefully, Soto can demonstrate a bit more patience and an improved ability to control the strike zone, as more advanced competition may be able to take advantage of his aggressive approach. While his hitting skills are both advanced and polished, his defensive skills are not. Soto was a shortstop when the Reds drafted him, but he clearly wasn't going to stick at the position. His poor agility and lack of first step quickness made it inevitable that he would slide down the defensive spectrum. 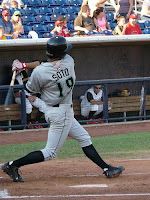 In 2009, Soto spent the majority of his time at third base and designated hitter. In the best case scenario, Soto would be able to stick at the hot corner, but it seems more likely that he'll have to shift to first base. He has the arm strength to handle third, but the accuracy on his throws isn't great. In addition, he's just not mobile or athletic enough for third base. As he fills out, he's likely to slide down the defensive spectrum yet again. Fortunately, he has the hitting skills to handle any position on the spectrum. Soto is one of the most intriguing offensive prospects in the Reds' farm system. He has a sweet swing and impressive raw power. Unfortunately, he isn't a great athlete and his other skills don't measure up to his hitting ability, but his bat will likely be strong enough to carry him to the major league level. Power is usually the last tool to develop, so it'll be very interesting to see what happens to Soto's already impressive power as he continues to develop. Given his swing and his amateur pedigree, it may not be much of a stretch to see him quickly develop into one of the premier power hitting prospects in the minors. Ideally, he'll be able to pair his contact and power skills with good on-base skills, but even if he doesn't he could be an impact hitter at the MLB level. Soto is still young and has a lot of development left, but his upside lands him at #2 on the list. 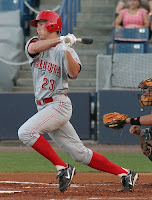 Todd Frazier is obviously one of the rising stars in the Reds farm system. He combines a tremendous baseball IQ with very strong baseball skills. He has an innate understanding of how to play the game. The beginning of his professional career has been impressive, but he seems poised to take a significant step forward in 2009. The Reds continued their trend of advancing prospects rather slowly up the ladder. Frazier, a polished college product was sent back to low-A Dayton to start off 2008. In Dayton, Frazier wasted no time in proving that he was ready for more advanced competition. He posted a stellar slash line of .321/.402/.598/1.000 with 7 homeruns and a 28/15 K/BB ratio in 124 plate appearances. It was obvious for all to see that Frazier needed a promotion and the Reds responded by moving him up to high-A Sarasota. At Sarasota, Frazier posted a solid .281/.357/.451/.808 slash line with 12 homers and an 84/41 K/BB ratio in 414 plate appearances. Not the most impressive line, but once again context goes a long way, as Frazer was better than his overall numbers. He posted an eye popping line drive rate of 26%, but suffered from the very pitcher-friendly environment in Sarasota. In addition, he was likely a bit unlucky, as his BABIP was "only" .337. Obviously, a .337 mark is ordinarily above average, but it actually seems a bit low in light of his 26% line drive rate. Frazier's overall numbers were dragged down by a bit of bad hit luck and a very unfriendly hitting environment. Even so, the Reds kept him in Sarasota to finish out the season. As if to illustrate the point that his overall numbers weren't indicative of his true level of performance, Frazier played in the Hawaiian Winter Leagues and quickly took out his frustrations on the opposing pitchers. In Hawaii, he posted a line of .350/.364/.700/1.064 with 1 homer and a 3/0 K/BB ratio. Oddly enough, the Reds still have yet to decide on a full-time position for Frazier, as during his three stops in 2008 he played shortstop, designated hitter, first base, third base, and leftfield. Part of the debate on Todd Frazier in prospect circles centers on his unorthodox swing. So, we might as well take another look. The defining characteristic of Frazier's swing is the complete extension of his left arm before the pitch arrives. For comparison sake, below there is a photo of Frazier in between photos of two of the best right-handed hitters of the modern era. Edgar Martinez and Albert Pujols are two of the best right-handed hitters of all-time and, not surprisingly, have swings that are very fundamentally sound. On the left, Edgar has just completed his stride and has begun to fire his hips. However, for our purposes, the important thing to look at is his left arm, which is bent at the elbow. On the right, Albert Pujols is in the middle of his stride, which is largely just picking up the front foot and placing it back down. 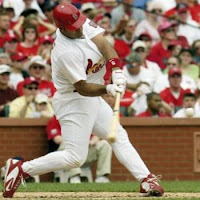 However, as with Edgar, you can see some bend in Pujols' lead elbow. If you look at the photo in the middle, then you can see Todd Frazier in mid-stride with a completely extended lead arm. There is no bend in his lead elbow, as he is basically using an "arm bar" type swing. He's managed to reduce it a bit at the professional level, but it is still very pronounced in his swing. The obvious question on this type of swing is whether it prevents the hitter from handling the inside pitches. 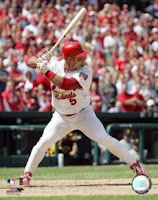 If the hitter's arms are extended well before contact, then it becomes much more difficult to turn on inside pitches. This has been the concern with Frazier since his professional debut, but he continues to defy expectations. He obviously understands his swing and what he needs to do to make it work for him. At this point, there is yet to be any indication that Frazier cannot be successful with his current swing. Despite the "arm bar," Frazier gets himself into good hitting position in the contact zone, which is the most important consideration. Again, comparing Frazier with Pujols (see: photos below), you can see a lot of similarities despite the differences in the early stages of their swings. In the contact zone, their lower bodies are in similar positions and they both keep their head down on the ball. In addition, their hips and shoulders have rotated similar amounts, though Frazier has opened up faster. The main difference between the two can be seen by comparing the position of the right arm. Pujols is effectively utilizing both arms in his swing, but the position of Frazier's right arm indicates that his swing is driven largely by strong shoulder rotation and pulling through with his lead arm. That's especially true on inside pitches, as his "arm bar" swing leaves him little option but to speed up the rotation of his shoulders and spin open to get the bat on the ball. As of now, the concerns about Frazier's swing are being drastically outweighed by his non-stop production. It's undeniably unorthodox, but style always yields to substance. Frazier continues to get the job done. It's been that way since the Little League World Series all the way through to the professional level and there isn't any reason why it can't continue at the higher levels. Over the past few years, the Reds player development philosophy seems to have changed, as they have become very deliberate in advancing prospects up the ladder. One would think an advanced college prospect like Frazier would have reached double-A by now, but the Reds have moved him slowly. In addition, another interesting aspect of the development philosophy is their hesitancy to lock players into a defensive position. As the Reds have improved their farm system, they have added more talent at every position, which has created logjams at the less demanding defensive positions. Instead of being proactive, the Reds have chosen to keep players in positions where there are unlikely to play at the MLB level. Frazier is the clear example of that, as he is still playing primarily shortstop despite the fact that he simply doesn't project as an MLB shortstop. Frazier lacks the first step quickness and good footwork needed to play shortstop at the higher levels. That said, he is very fundamentally sound. He has good hands and a strong arm, both of which play very well at third base. In addition, his skill set profiles well in leftfield. Ultimately, the Reds simply need to decide where they need him most and let him learn the nuances of that position. Versatility is great, but Frazier has the ability to be an every day player and it's time the Reds develop him accordingly. Frazier is a very promising prospect. He's a very good athlete and his baseball IQ and overall makeup allow his skill set to play up a tick. His intangibles are very strong, which should make him a good addition on the field and off. Frazier is a heady player who makes his unorthodox swing work for him and once he is given a permanent position, he should be on the fast track to the majors. At this point, Edwin Encarnacion's glove may create an opening at third base and Frazier has the skills to fill that opening. For now, Frazier checks in at #3 on the list and it shouldn't be long before he's making an impact at the MLB level. Drew Stubbs continued to demonstrate tremendous athleticism and a well-rouned skill set in 2008. After being very conservative with his development and keeping him at low-A Dayton for the entire 2007 season, the Reds seemed to reverse course by aggressively moving Stubbs up the ladder in 2008. 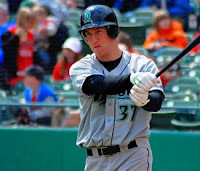 Ultimately, Stubbs made three different stops in the minors in 2008, finishing up at triple-A Louisville. It was disappointing not to see Stubbs get a September call-up to the majors, but considering that he made a three level jump in the minors it's understandable. Even though he didn't make it to the majors, Stubbs certainly solidified his status as one of the top prospects in the system. 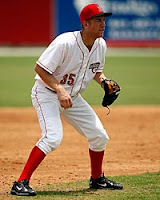 The Reds sent Stubbs to high-A Sarasota to start the 2008 season. 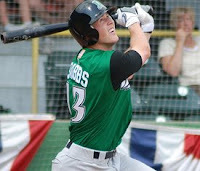 For Sarasota, Stubbs posted a slash line of .261/.366/.406/.772 with 5 homeruns in 358 plate appearances. Perhaps most impressively, his K/BB ratio improved to a stellar 82/50 mark. He cut down on his strikeout rate and increased his walk rate from his 2007 level of performance. In addition, he posted a stellar line drive rate of 26%. Given that Sarasota is a difficult hitting environment, his homerun total really isn't all that disappointing. He also found time to swipe 27 bases in 35 tries, which was good for a 77% success rate. The Reds advanced Stubbs up the ladder to double-A Chattanooga. At double-A, Stubbs piled up 106 plate appearances and posted a slash line of .315/.400/.402/.802 with 0 homeruns. He also posted a 21/11 K/BB ratio. Double-A pitching didn't slow him down much, as he continued to make hard contact, evidenced by 23% line drive clip. The final of his three minor league stops landed Stubbs at triple-A Louisville to finish out the 2008 season. He had 84 plate appearances and posted a .293/.354/.480/.834 with 2 homeruns and a 20/6 K/BB ratio. Once again, his solid 20% line drive rate demonstrated his ability to center the ball on the bat. Stubbs has the type of tall, lean, athleticism that intrigues scouts. He's tall and lanky, but explosive, possessing both plus power and speed. Stubbs' problem has been his inability to make consistent contact, which is almost to be expected given his height. He has a larger strike zone and longer arms to get through his swing. While he has been plagued by strikeouts in his professional career, he seemed to turn the corner when he was required to choke up on the bat during the tail end of his 2007 stint at low-A Dayton. After choking up, Stubbs exhibited increased bat control, which enabled him to drastically cut down on his strikeouts. Not surprisingly, his offensive production improved as a result. Of course, the question was whether his improvement was real and would carry over into 2008 or merely the result of a small sample size that would prove illusionary over the course of the 2008 season. In 2007, Stubbs struck out once every 3.5 ABs for Dayton. In 2008, he struck out once every 3.7 ABs for high-A Sarasota, every 4.4 ABs for double-A Chattanooga, and every 3.8 ABs for triple-A Louisville. Obviously, Stubbs was improving even as he climbed the ladder to face a more challenging level of competition. However, it would be inaccurate to say that it was simply the result of choking up on the bat a couple of inches. In actuality, Stubbs has made more substantial changes to his swing. During his professional career, Stubbs has worked to shorten up his swing. Perhaps not surprisingly, he has also adopted a wider stance at the plate. His setup is not as extreme as the one utilized by Chris Valaika, so he still utilizes a traditional stride to effectuate his weight transfer. The wider than shoulder width stance gives him a bit more stability at the plate and reduces some of the lower body action in his swing, which improves his economy of movement. His stance is fairly quite and includes a high back elbow and a small bat waggle. He has also shortened up his swing path both to and through the ball. Once in a while his swing seems to get a bit top-hand heavy. Instead of pulling the knob of the bat at the ball and exploding out through it, he extends his arms too early by letting his top hand seemingly push the swing to meet the ball. Overall, Stubbs has a simple and fundamentally sound swing. Obviously, when trying to cut down on strike outs, length and wasted movement are the enemies. Through his efforts, Stubbs has managed to reduce his strike outs, but that improvement has come at a cost. In his quest to cut down on the strikeouts, Stubbs has reduced his power output. Stubbs has very impressive raw power, but it really isn't translating into homerun numbers. At this point, Stubbs' efforts to limit his strikeouts and improve his contact rate have robbed him of some power. However, if Stubbs can improve his contact rate, then the power should eventually follow. He also has to get comfortable with the changes he has made, which should only help him rediscover his power. As you can see in the following video clip, even with the shorter, more contact oriented swing, Stubbs can still absolutely launch the ball. For video of Stubbs at the plate in the Arizona Fall League, click here. As intriguing as his offensive game may be, Stubbs' calling card is still his defense. 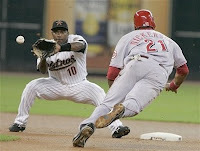 Stubbs was already a Gold Glove caliber defensive centerfielder when he was drafted out of the University of Texas. Stubbs is a very valuable combination of plus defense at a premier defensive position. His speed and instincts allows him to cover a massive amount of ground in center and he also has enough arm strength for the position. The Reds have long struggled to develop prospects who can legitimately handle the premier defensive positions. However, this is obviously beginning to change. In the best case scenario, Stubbs joins Chris Dickerson and Jay Bruce to give the Reds the best defensive outfield in baseball. Statistical analysis has begun to focus more on defense in recent years with the result that defense is more important than commonly realized. As new defensive metrics are developed to translate defensive performance into run value, defense is being valued much more highly. Fox Sports' Dayn Perry recently took a look at common attributes of World Series winning teams and one common thread he found was that they often had two legitimate centerfielders starting in their outfield. If Dickerson and Stubbs continue to develop, then they could really transform the future of the organization. At this point, the worst case for Stubbs seems to be that of a bottom-of-the-order MLB hitter with Gold Glove caliber defense. He has managed to cut down on his strikeouts, but the emerging question is whether his power will return. If it does, then Stubbs will be an impact player with 20/20 potential at the MLB level. If it doesn't, but his contact rate stays strong, then he has the on-base skills to be an effective MLB tablesetter. It's not a question of whether Stubbs will be a quality regular at the MLB level, but rather just how good he'll be at the plate when he arrives. He has tremendous athleticism and a diversified skill set, but ultimately it will come down to whether his power translates into homerun production. For now, Drew Stubbs checks in at #4 on the list. Chris Valaika was a steal for the Reds, as they drafted him in the third round of the 2006 draft. If it wasn't for injury, he likely would have gone higher. Valaika is part of the Reds renewed emphasis on the premier defensive positions and on players with strong work ethics and good baseball instincts. Valaika is an early count hitter who doesn't wait long to offer at a pitch. Obviously, that's an approach that will reduce his walk rate. Unfortunately, he doesn't provide overwhelming power or speed, so his value is going to be driven by a high contact rate and the resulting high batting average. In 2008, he put his offensive skills to good use. Valaika opened up the 2008 season back at high-A Sarasota. In 2007, Valaika struggled at Sarasota, which knocked some of the luster off his rising star in the eyes of some. However, Valaika certainly got it right in his second go-around, when he bounced back with a vengeance. In 2007, Valaika scuffled to a slash line of .253/.310/.332/.642 in 217 ABs with Sarasota. In his 2008 return engagement, Valaika posted a .363/.393/.585/.978 with 7 homeruns in 135 ABs. He ripped line drives all over the yard at a stellar 26% clip. His BABIP was an astronomical .420, but when you hit line drives at that clip, it's hardly unexpected. He continued his trend of early-count hitting, as evidenced by his 29/7 K/BB ratio, but he certainly made it work for him. You can't post a slash line like that without opening a few eyes and in Valaika's case, it earned him a promotion to double-A Chattanooga. At double-A, Valaika posted a line of .301/.352/.443/.795 with 11 homeruns in 379 ABs. Again, he evidenced an aggressive, early-count approach which resulted in a 74/28 K/BB ratio. He also continued to center the ball on the barrel and drive the ball with authority, including line drives 22% of the time. As to be expected, his BABIP fell along with his line-drive rate, landing at .350 on the season. As if that wasn't enough, Valaika finished out the 2008 season in the Arizona Fall League. His production continued to be as steady as a metronome. He posted a familiar slash line of .311/.346/.437/.783. Valaika's calling card is likely to be a high batting average, poor on base skills, and solid pop. Here's a video compilation of Valaika in action at the plate. As you can see, Valaika is yet another hitter who opts for the widespread stance and minimal forward stride. He has actually made some significant changes to his swing mechanics. In college and early in his professional career, Valaika utilized a higher leg kick. Clearly, that's not the case now. He has abandoned the high leg kick in favor of the wider stance, which seems to be the emerging trend in professional baseball. More and more hitters seem to be utilizing the wider stance and fewer seem to be using the narrow stance, big leg kick, and long stride. Valaika's swing changes were likely made to shorten up his swing, make him quicker to the ball, and make him less susceptible to being out on the front foot on good offspeed pitches. Valaika uses a high back elbow and a compact swing. He swings hard and often. His swing is just as aggressive as his hitting approach. His aggressive swing sometimes causes him to spin out or roll over on his front foot. He uses a slight uppercut in his swing, which enables him to get good loft on the ball. However, at times his back leg will breakdown and his back shoulder will drop, causing him to get under the ball too much. Valaika makes his "grip it and rip it" approach work with his ability to make hard contact. He has good hand eye coordination and excels at putting the barrel of the bat on the ball, which allows him to drive the ball with authority to all parts of the field. His swing isn't complicated, but rather compact and easily repeatable, which should help him avoid prolonged slumps. The chart to the right is the distribution of Valaika's balls in play for Chattanooga in 2008. Clearly, he is comfortable using the whole field. The red dots are outs, the blue dots are homeruns, and the green dots are hits. In the video clip, you can also see that Valaika has a thick, muscular build and clearly isn't fleet of foot. He doesn't get out of the box or down the firstbase line very quickly. His agility and lack of quickness don't impact solely his offensive game, but they also impact the defensive side. Plain and simple, the biggest question on Valaika is whether he can handle shortstop. Defensive statistics are still in the infancy stage at the minor league level. Even so, they are beginning to emerge. Minorleaguesplits.com has started listing a defensive metric for prospects. One prospect for whom they have defensive statistics is Chris Valaika. For Chattanooga in 2008, Valaika had 310 chances at shortstop. Of those 310 chances, he converted 205 of them into outs. All of which was good for -3 Runs and -5 Runs/150. "Runs" is relative to league average, so +15 is outstanding and + 10 is a very good fielder, while -10 is rather poor. Runs/150 estimates runs saved per 150 games. I can't vouch for the accuracy of the metric, but it does dovetail with both his reputation and the opinion of scouts. At this point, Valaika at short seems like a stretch. Scouting reports on his defense have actually been better as of late, but it's difficult to get behind the idea of a "fringe" defensive player at shortstop. On the plus side, Valaika has a strong, accurate arm, but he lacks quickness and his range is barely adequate. He profiles well at secondbase, but the Reds already have Brandon Phillips at the position and have shown little inclination to shift him across the bag to shortstop. So, for now, Valaika's best chance at a starting job with the Reds is at shortstop. Last offseason, it seemed that I was higher on Valaika than most, but after his bounce back performance in 2008, it seems that the hype has really caught up to Valaika. In fact, the hype may now be outpacing his actual level performance. Valaika is an intriguing prospect, but I do have my concerns. He certainly has his strengths, including the ability to make hard, consistent contact, a strong arm, and solid power. But, he also has some weaknesses, which include an inability to control the strikezone, below average speed, and questionable range in the field. Valaika is a solid prospect, but I'm beginning to think people are ramping the expectations up too high. At this point, the ultimate offensive ceiling on Valaika in Great American Ballpark would seem to be 18-20 homeruns with a .300 batting average. If he can reach his ceiling, then he would have a great deal of value as a middle infielder. But, his lack of speed, on-base skills, and limited range at shortstop will likely drag down his overall value. While it's rather questionable whether he will reach his ultimate offensive ceiling, it's fairly certain that his drawbacks will always be there. If he continues on his current track, then Valaika projects to be a solid MLB middle infielder. There is certainly a good deal of value in a solid, homegrown, cost-controlled middle infielder, so for now Chris Valaika checks in at #5 on the list. Chris Dickerson, cousin of former NFL great Eric, has long been the best athlete in the Reds' farm system. However, prior to 2008 it looked like he would never translate his massive athletic skills into functional baseball tools. Nowhere was this truer than at the plate, where he just never made enough hard, consistent contact to be a productive hitter. Despite his struggles, Dickerson's tremendous athleticism made him a candidate to "flip the switch" and instantly become an impact player. It's still too soon to tell, but that may be exactly what happened in 2008. 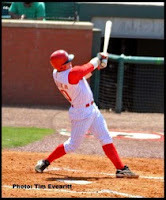 The Reds sent Dickerson back to triple-A Louisville to start the 2008 season. He didn't start out very well, posting a lackluster .241/.347/.349 slash line in 98 plate appearances in April. He followed it up with an even less inspiring .242/.290/.339 line in 69 plate appearances in May. However, at that point, his entire career changed. The Reds have been incredibly patient with Dickerson's development due, in no small part, to his tremendous athleticism. However, until June of 2008, he had consistently underwhelmed. His raw tools never translated into baseball skills or quality production. In June, something seemed to click and his production finally began to match his raw tools. In 93 plate appearances in June, Dickerson hit .301/.441/.479 with a stellar 21% line drive rate. He didn't slow down for the rest of the year. In 110 plate appearances in July, Dickerson posted a "Ruthian" slash line of .326/.418/.717 with 8 homeruns. In 40 plate appearances in August, Dickerson posted a solid .351/.400/.432 line before the Reds finally called him up to the show. The real question is was it for real or just the result of a small sample size? Obviously, Dickerson's BABIPs jumped significantly in the final three months, but that's not unexpected given that he was hitting line drives at a much higher clip. The type of ball in play determines how often they fall in for hits and no type of batted ball results in a hit more frequently than a line drive. So, while there is undoubtedly some luck in those BABIPs, they were driven to significant degree by his improved performance. However, what remains unclear is how much was the result of Dickerson being "locked in" and on a white hot tear? What strikes me as interesting is that if it was merely a hot streak, how did he manage to carry it with him to the Major League level? Can you carry a hot streak up the ladder with you despite facing more advanced pitching? The Reds called Dickerson up in August after the departure of Adam Dunn. Dickerson's first Major League game was August 12th, in which he went 1-for-4 with a walk. It wasn't long until Dickerson was racking up multi-hit games at the MLB level. He only played in 31 MLB games, but had 7 multi-hit games. In those 31 games, he had 102 ABs, six of which resulted in homeruns. All told, Dickerson posted a slash line of .304/.413/.608/1.021 during his MLB stint before being shutdown with a stress fracture of the ankle. Even so, Dickerson was the only reason to watch the Reds in the dog days of summer. While his time in the majors was undeniably minor, his impact was unquestionably massive. Obviously, Dickerson isn't Babe Ruth reincarnated, so it would be unreasonable to expect him to post anything close to a 1.021 OPS over the long haul. In addition, Dickerson posted an 18.5% line drive rate, but a .410 BABIP, so more balls fell in for hits than is to be expected. However, the great thing about a player like Dickerson is that his secondary skills are so strong that he only needs to hit ~.260 to be very valuable hitter. His stellar walk rate means that if he can hit just .260, then his OBP will be ~.360. On top of that, his power will generate a significant number of home runs and his speed will allow him to swipe him quite a few bases. 1) Can he make enough contact to hit .260? 2) If he does hit .260, will the Reds be smart enough to see just how valuable that will make him? Not only did Dickerson put up massive production in 2008, he did it with a sweet swing. Dickerson has a quiet stance at the plate. He stands tall at the plate and when the pitcher is in his windup, he bounces the bat off his shoulder a couple of times as a timing mechanism. He has a very small stride, which is really just him rolling up on his toes and putting his foot back down. He has a quiet lower body and very strong balance throughout his swing. Dickerson has a smooth, flowing swing that you only see in lefthanded hitters. He fires his hips well, which generates significant rotational velocity. Rotational velocity of the hips is a key factor in the amount of power generated by batters. The more rotational velocity you can create, the more momentum you will produce. The greater the momentum when you contact the ball, the greater the force you impart on the baseball. Dickerson has strong hip action, which creates substantial rotational velocity and allows him to impart substantial energy to the baseball. He can really drop the head of the bat on the ball and when he does it usually travels a long distance. He gets good extension, but his swing does have a tendency to get too long, which can exacerbate his problems in making consistent contact. Dickerson has a tremendous set of tools, but what makes him all the more intriguing is that he plays a premier defensive position and plays it very well. One of the things I've come to appreciate is the value of players who combine plus defense and plus on-base skills while playing premier defensive positions. That's why both Paul Janish and Chris Dickerson intrigue me. By now, everyone understands the importance of on-base percentage in the game of baseball, but you usually only find the players with plus on-base skills at the corner positions. It's not hard to find a first baseman or leftfielder with above average on-base ability, but you don't often see players who combine the requisite defensive skills to play a premier position with the ability to control the strike zone needed to post high on-base percentages. In the Reds organization, both Dickerson and Janish have these attributes, which is why they deserve a longer look to see if they can be productive enough at the plate to hold down starting jobs. If everything breaks right, Dickerson could be a gold glove caliber centerfielder with power, speed, and strong on-base skills. Clearly, Dickerson's 2008 level of performance is not sustainable and an expectation of that is not what earns him his spot on this list. Even so, no one climbed higher on this list in the course of one year than Chris Dickerson. The big question remains whether he will make enough contact to post a respectable batting average. However, he has such a diverse set of skills that he really only needs to hit ~.260 to be an impact player at the MLB level. Dickerson is older than most of the other prospects on this list, but his upside remains considerable and in 2008 he took a big step towards reaching it. It will be very interesting to see how he performs in 2009 and, frankly, I think he's a big key to the Reds' chances in 2009. For now, Dickerson's massive tools and increased polish land him at #6 on the list.